TOKYO, Japan, December 2, 2010 (ENS) – Japan’s whaling fleet has been scaled back and today departed late for the Southern Ocean aiming to catch hundreds of minke whales and 50 fin whales. The Japanese whaling fleet traditionally departs by November 19 and returns in April but this year will conduct a shortened hunt with fewer vessels. The whaling fleet has not delayed its departure into December for over 20 years. During the 2009-10 season, the Japanese fleet included a factory ship, three harpoon ships, a supply ship and two security patrol vessels. But the support vessel Hiyo Maru No. 2, which fueled the fleet and transported frozen whale meat back to Japan, was scrapped in September according to Lloyd’s Seaweb. Two ships that previously did whale sightings have been sold or scrapped, and one former harpoon vessel, the Yushin Maru 3, will be used only for sighting whales. In the Southern Ocean the smaller Japanese whaling fleet will face a larger conservation fleet determined to prevent the whalers from killing whales. In Hobart, Australia today the Sea Shepherd Conservation Society officially set sail for their 2010-11 Antarctic Whale Defense Campaign, Operation No Compromise. “This year’s fleet is the strongest to date including veteran vessels the Steve Irwin and Bob Barker, with the addition of the newly-acquired trimaran Gojira, Japanese for Godzilla, with the necessary speed and power to outrun the whalers and put an end to their shameful activities,” said Sea Shepherd Founder and President Captain Paul Watson. 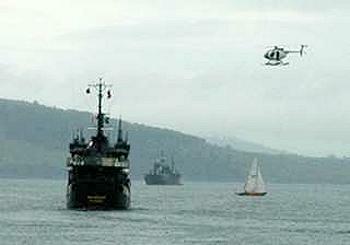 Sea Shepherd also will deploy a more capable helicopter this year, he said. 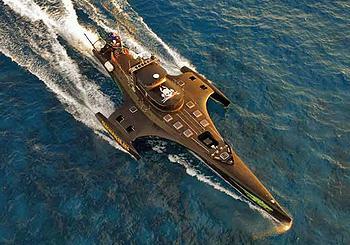 Gojira is expected to rendezvous with the rest of the fleet this weekend. With a Sea Shepherd crew of 10, the Australian-registered trimaran is currently en route from Western Australia with Captain Locky MacLean at its helm. The 115-foot stabilized monohull vessel was the current record holder for successfully circumnavigating the globe in 1998 in just 74 days, a record to later be broken by the trimaran Ady Gil, which was lost at sea during last year’s campaign after a collision with Japanese harpoon ship the Shonan Maru No. 2. In Tokyo, Greenpeace Japan said today that the reduced size of the Japanese whaling fleet means they will be unable to catch more than half of their quota. “This year, the Japanese whaling program will not have enough catchers to kill its usual number of whales and will not have enough onboard freezer space to store the resulting meat,” said Greenpeace Japan oceans campaigner Wakao Hanaoka. Conducted since 1987 under the guise of scientific research to circumvent a worldwide commercial whaling moratorium that took effect in 1986, Japan’s whaling takes place in the North Pacific and in the Southern Ocean Whale Sanctuary near Antarctica. 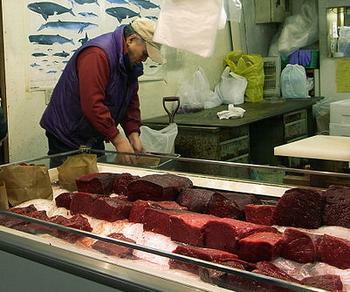 But few Japanese people eat whale and much of last year’s take is still unsold. Forty-four percent “neither agree nor disagree,” with resumption of commercial whaling, 31 percent “agree,” and 25 percent “disagree,” according to a 2008 public opinion poll commissioned by Greenpeace Japan and conducted by the Nippon Research Center, a member of Gallup International Association. “Sales of whale meat are so poor that Japan’s fraudulent whaling programme can no longer afford the cost of at-sea refueling, so they are shortening their season,” said Hanaoka.